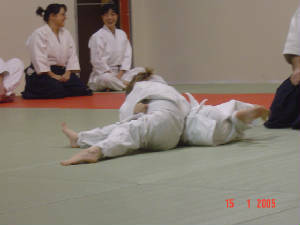 This is a class designed for 4-6 year olds to develop a basic understanding of the fundamental principles of Aiki-Judo. Emphasis is placed on safe breakfalling techniques and basic throwing techniques that focus on correct body movement, posture and balance. The class is a balance for physical activity, instruction, relaxation and games that promote health, fitness, mental focus and determination. All this is accomplished in a safe and fun environment. Class Time: Tuesdays 6:15-7:00 p.m.